Instead throwing all Mexican food out the window in my quest to eat better, I try and find ways to make it healthier yet still delicious enough to make me daydream about it alllll day long. 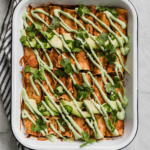 Butternut Squash and Black Bean Enchiladassssssssssssssssss. OMG. In a freaking skillet. Let’s discuss this magical concoction that jumped out of my mind, into the skillet, and down my belly. …Or we could just stare at photos and drool? No, I definitely need to explain how good this dinner is! It all started when I discovered an extra butternut squash laying around. 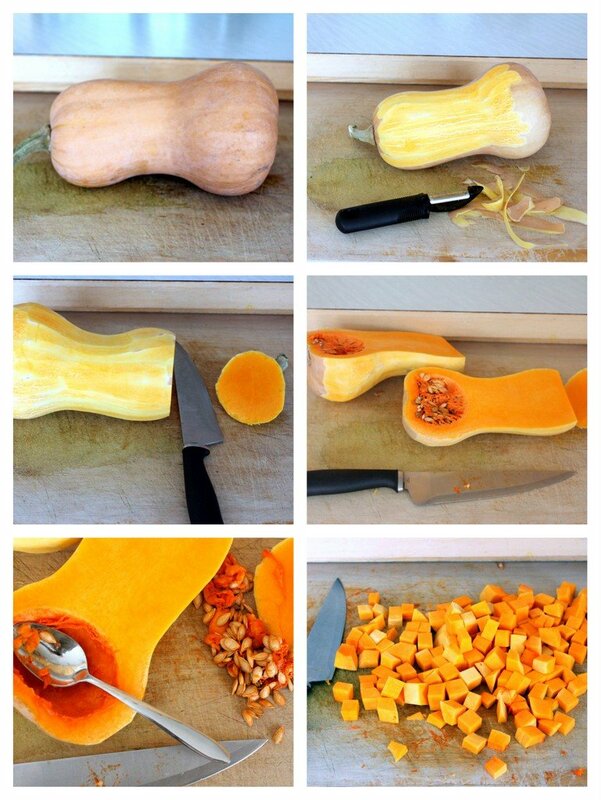 If you aren’t familiar with how to properly cut a butternut squash the photo tutorial below should provide you with a good example. You’ll need to peel the squash, cut off the ends, and slice it down the middle. Then simply scoop out the seeds (roasting them is awesome! ), and cut the butternut squash into cubes! Just be VERY careful when using your knife! If you decide that you aren’t in the mood to cube a squash, you can usually purchase cubed butternut squash at the grocery store. The butternut squash is sauted in the skillet with a bit of olive oil and onions, jalapeno, and Mexican spices until it becomes tender. Next, the black beans are added to the skillet, along with thick cut slices from yellow corn tortillas, red enchilada sauce, and some cheese. We’re stirring up oooey gooey enchilada love here. See? The smells are completely intoxicating, but it’s perfectly okay to inhale it as much as you’d like. That’s right, I’m giving you permission to get a buzz off of making enchiladas. Don’t take these smells for granted. Seriously. This is my little bit of heaven. All that’s left to do is add a bit more cheese on top of the enchilada skillet and pop it under your broiler for a few minutes! How easy is that?! One serving (1/4th) of this recipe has right around 400 calories! 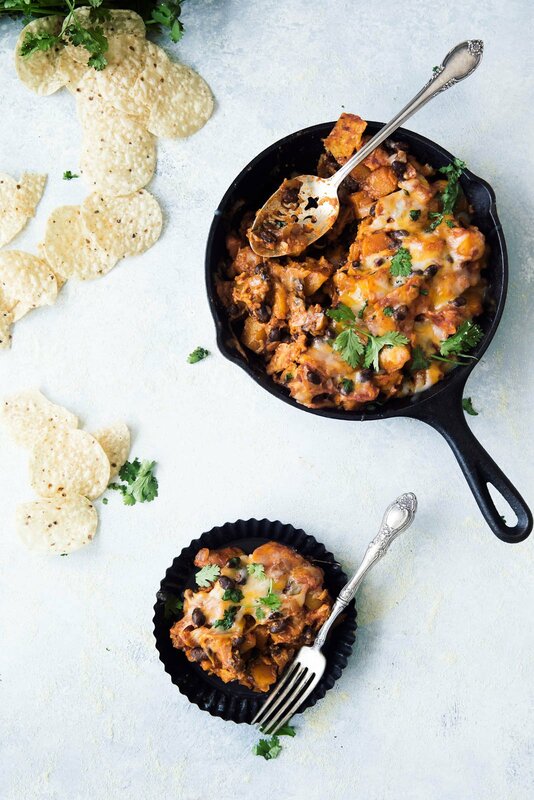 Yep that’s right, you get a heaping scoop of this delicious enchilada skillet casserole with 13g grams of fiber and 16 grams of protein too! 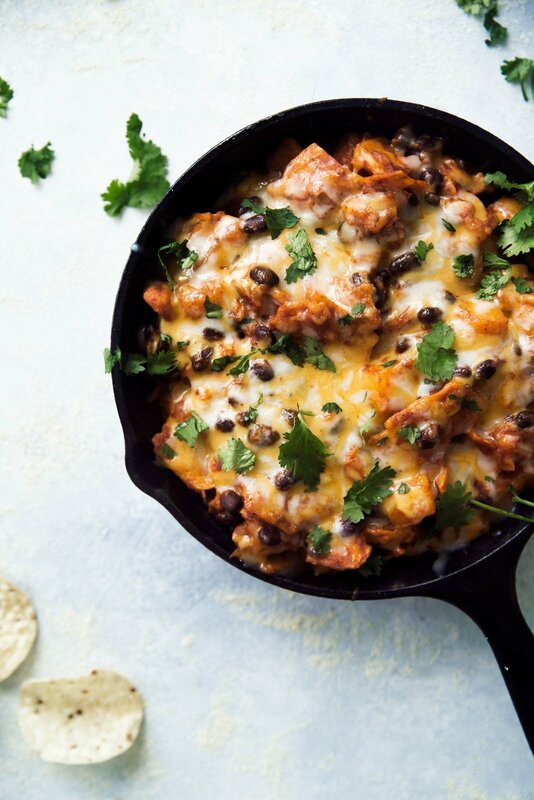 A healthy vegetarian Mexican-inspired dinner -- butternut squash and black bean enchilada skillet. Ready in less than 30 minutes! 13g fiber & 16g protein per serving! Heat olive oil over medium-high heat in large oven-proof skillet. Add onions, garlic, and jalapeno and cook 2-3 minutes until onions become translucent and garlic is fragrant. Add cubed squash, cumin and chili powder and season with salt and pepper. Cook, stirring occasionally, until the squash is slightly tender, 10-13 minutes. You want the squash to be fork tender, but not so tender that it starts to fall apart and become mush. Next add the black beans, corn tortilla pieces, and can of enchilada sauce and stir to combine. Reduce heat to medium-low and sprinkle in 1/2 cup of cheese. Stir again and simmer for a few minutes. Turn on your oven broiler to high. 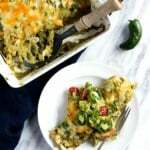 Sprinkle an additional 1/2 cup of cheese over the top of the enchilada mixture and place in oven under broiler for 3-5 minutes until cheese melts and tortilla edges become a tiny golden brown. Remove from heat and serve immediately. Feel free to add in cilantro. Serve with sour cream, guacamole, or hot sauce! Enjoy! 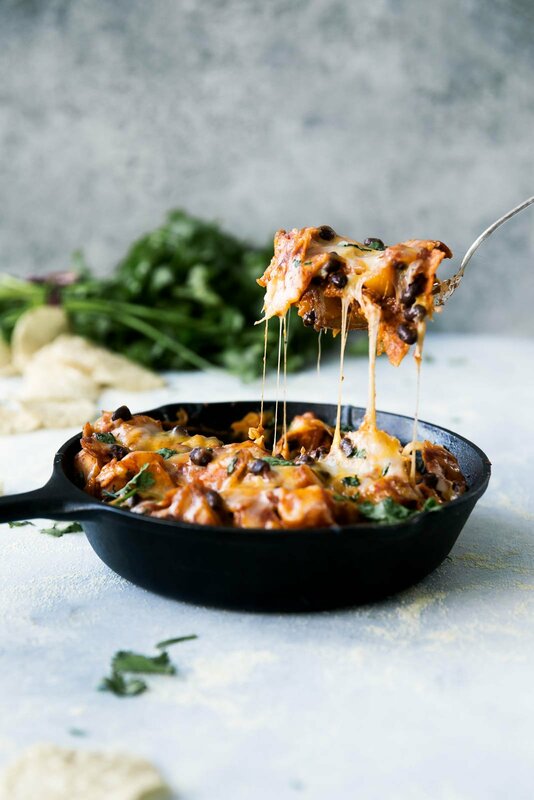 169 Responses to "Butternut Squash and Black Bean Enchilada Skillet"
This looks delicious, easy, and relatively healthy! I’m going to make this for a dinner party this weekend. This is one of the only dishes that I want to lick my plate clean!!!! I am heavy handed with the cumin & chili powder.. & use a whole seeded jalapeño!! This looks incredible! I love how you prepared your squash. I’ve never peeled and cubed them this way. I’m going to have to try that next time. Made this tonight…YUM!!! Thinking I might add chicken sausauge next time. Ok, this is in the oven right now. I decided to let it heat through at 350 for 20 minutes. Can’t wait to try it with a dollop of sour cream! I added more sauce and some additional cumin and chili powder. Thanks for the recipe! This looks so delicious!!!! WOW!!!! This looks so delicious!!! WOW! I just bought a butternut squash today. This is the recipe I will use it in. Looks delicious! I make make some mash up of this and your Spicy Black Bean Chicken Enchiladas with the Pumpkin Sour Cream Sauce tonight. Love that earlier recipe and I have leftover pumpkin sauce! Do you recommend roasting the butternut squash halves before putting it into the skillet? Roasting it sure makes peeling a lot easier and brings out a lot of flavor. I’m concerned about over-cooking the squash though. Thanks! I read a “hack” recently that if you microwave the squash for 2 or 3 minutes the peeling it is much easier. 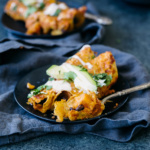 I haven’t tried it yet but I have a butternut squash and I want to make this recipe so I am going to try it. I didn’t have butternut squash so I used sweet potatoes and let me tell you it was a good dish. Thanks for the recipe. This was so easy to make! We are doing meatless Mondays and this was perfect for a very cold and crisp evening. Leftovers tasted even better. I did however use a little more enchilada sauce than called for in the recipe and it turned out fine. I might call these chilaquiles. No matter, whatever you call them, sounds delicious! I LOVE this recipe! I found it last week, ate it several times as leftovers, and made it again tonight. I love that it satisfies the Mexican craving and you can eat quite a bit without tons of calories. I love some kick, so I used a whole jalapeño, extra cumin & chili powder. Thanks so much for the great recipes–love your blog! I love that you jazzed it up! Awesome recipe, great pictures — what’s not to love? Well, just one thing: homemade enchilada sauce is a snap to make and so much more nutritious than the chemical-laced stuff in a can, which always seems to have a metalic taste. There are recipes all over the internet; in less than 10 minutes, you will swear off buying those cans forever! — and it’s a lot cheaper, too. Thanks for the recipe! So yummy! I just made this tonight but with sweet potatoes and salsa instead of enchilada sauce. I’m a huge fan of nachos, this is a great ‘healthy’ option! Thanks! Sweet merciful heaven. As someone who grew up in San Diego, I appreciate a good Mexican dish. That is just…amazing. Thank you for this recipe!! This was fantastic! Your recipes have all been incredibly tasty and straight-forward. My whole family is also obsessed with your oat flour banana bread. Keep the GF pancake and baking ideas coming! Thanks for posting this! I made a mole variation yesterday (just posted on my blog) and it was awesome. Looks like I may have just located a way to use up the butternut squash I have. Yum. I made this last night and it was TO DIE FOR. Thanks so much for the recipie! Every time I hang out with you we eat Indian food… I'm led to believe that all you eat is Indian food… This isn't Indian food… I don't think you made it. I don't make the Indian food we eat when we hang out… Pay attention Marty! Anyone know how many WW points in this? Made this last night and had to refrain from going back for 3rds. Had the leftovers tonight and it was just as good if not better! I topped it with your Smoked Chipotle yogurt sauce and avocados….mmmmm. Thanks for the great recipe. Ay yi yi!! I made this dish and it was super yummy! LOVED IT! Yay, it IS super yummy! I'm going to make it again next week. She just put up a recipe for some dairy/gluten free peanutbutter/oatmeal/chocolate chip cookies I want to try. I made this 2 weeks ago and my boyfriend has been asking me to make it again ever since! Making it for dinner tomorrow night! =D YUM! Ellen, do you order the co op? 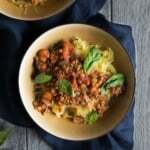 We get butternut squash in it sometimes and I'm always at a loss on what to make with it@ This looks good! 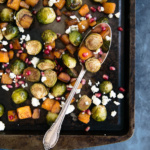 I'm going to make this today but use sweet potatoes instead of squash! I made this last night and omitted the corn tortillas and jalapeño, since I had neither on hand. This is a really delicious tasting and filling meal. I might serve it for lunch with some quinoa to up the protein and fiber. Thanks! I just made this but turned it into a soup! I cooked everything together (except for the corn tortillas) and added the cup of cheese and melted it all together then threw it in the blender with a little water. I toasted a flour tortillas and dipped it into the soup instead:) Pretty yummy I thought! This is such a creative idea. I’m pinning it for fall when butternut squash are everywhere. Good grief this looks amazing! I guess I'm heading back the the grocery store! Darcy Bowers Webb -those cookies are amazing! I made two batches and they were gone in two days! I made this last night…AMAZING! This is definitely a recipe that will be made a lot in our house now! I just got a bag of “Food Should Taste Good” brand Harvest Pumpkin tortilla chips that I am going to try this recipe with. Sounds delicious! This may be weird, but neither my husband or I can eat tomatoes. Do you think I could sub pes to? I’m actually allergic to tomatoes as well. 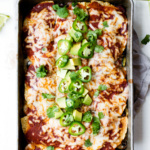 I’m on my phone so I can’t add the link right now, but on the blog Gimme Some Oven there is a recipe for enchilada that uses spices like chili powder instead of tomato to make the sauce. I use it all the time in recipes using enchilada sauce! My boyfriend, who is a hearty eater, said no-one would ever believe there’s no meat in this! We both loved it. Making out tonight for a potluck, I’m sure it will go over well. Tried this recipe tonight and added an extra jalapeño, poblano and habanero. Yum-a-dum-dum! Thank you!!! Re-pinned 🙂 Congrats on it making your Best Of this year! Can you use flour tortillas instead? This is my favorite recipe!!!! Love it!!! Making it again tonight. Holy crap! This was good! We skipped the broiler and added ground sausage…topped with plain Greek yogurt and chives! YUM!!!! made it and loved it! i love your recopies. I use clean eating magazines and your website most! Made this again tonight and everyone loves it! So yummy!!! My daughter is almost 1 yr. and it's a constant stress to figure out what to feed her (largely because before she was born I didn't really cook meals for myself) and I don't have much of a frame of reference to work from. I made this for her and she loves it! I'm hoping I can find other recipes to make for her. This was so amazing! I made a couple changes based on our taste and what we had around (used a small can of green chiles instead of the jalapeño and tortilla chips instead of corn tortillas for the top), and it was completely delicious! We will definitely be having this again and again. Thanks for the awesome recipe! YUM! This was wonderful. Thanks for the recipe! Trying it this weekend! Love the idea. Thanks! Looks great. But, I’d like to see more receipes using dried beans. I absolutely love this and am making it again today!! Perfect rainy day meal!! 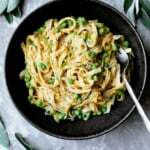 Tried this recipe as part of my 30 Before 30 project, to cook 300 Pinterest recipes in a year and a half. It was yummy, thank you! Made this tonight. My 4yr thought it was too spicy but he loved it so much that he didn’t care! He scarfed it down! Will definitely make again but a lil less spicy for him. It’s for 4. I changed it earlier in the year to make it more filling! 🙂 Hope you make it. Incredible! I had to use flour tortillas rather than corn, but it was still great. And I felt so good eating it, knowing the major ingredient was such a nutritious vegetable. My only concern was the amount of sodium in the enchilada sauce, combined with the added table salt and the sodium in the can of black beans. Rinsing the beans helps, and perhaps forgetting the table salt could help. Any ideas for lowering the sodium of the sauce? Favorite low-sodium brands? I cannot say enough about this dish! It was so delicious and filling- we did not miss the meat at this meal! This looks so delicious. Do you think I could use sweet potatoes instead of butternut squash. I made this tonight! I tend to be liberal with the spice!! We love it and will make it again!!! This was delicious! My boyfriend was a big fan too. I followed the recipe exactly, except I used homemade enchilada sauce. This took WAY longer than the stated prep time. Peeling and cubing a butternut squash, dicing an onion, and peeling and mincing garlic…. at least 30 minutes! Good news is, it was very tasty! Just be sure to cube that squash into little pieces so that it really soaks up the flavors! This was delicious! My entire family loved it and I almost never get all of them on board at one time! Yum! I look forward to making this. Just a note to other cooks: Costco, Trader Joe’s and other stores have butternut squash already cut up and cubed. Saves a lot of time and effort if that’s needed. Perfect tip! I hope you enjoy this one, Karen! This quickly became one of my favorite recipes. It is sooo good (and easy to make). Thank you Monique!!!!! Had a similiar bowl for dinner at Mi Mole on Friday so was so excited to see this recipe. The butternut squash took forever to cook on the stove. After 20 minutes, threw the rest of the ingrediants in the skillet and called it good. It was delicious! Next time I will roast the butternut squash then add to the onion mixture along with the rest of the ingrediants. The squash was a bit undercooked. I am also tempted to add 20 oz of enchilada sause or a mole. What size cast iron skillet is everyone using? I have 10 and 12. Thanks. Can’t wait to try this. BTW your Best healthy turkey chili is literally the best ever. Thanks you for a lifetime recipe. I typically use a 10″! This recipe is so delicious – you’ll have to let me know how you like it. And I’m so happy you love the turkey chili! Best go-to ever. Made this dish tonight and all I can say is OMG Flippin fabulous. Thanks for sharing such a wonderful healthy recipe. I spend a lot of time making dishes from Skinnytaste but will be making many more Ambitious kitchen recipes! I am SO happy to hear that! This is one of my absolute favorites. Hope you find some more here that you love! This was super-good! I substituted 2 cups of cooked brown rice for the corn tortillas, as my husband can’t eat corn, and it was still so very good! That sounds great! Glad you both enjoyed! My kids love this. I use green enchilada sauce instead of red bcs it gives me less heartburn. Delicious! I found the directions a little all over the place and found I completely forgot the jalapeño. The recipe video can help when there are quite a few things to add to your pan 🙂 If you’re adding extra ingredients (especially meat) I would definitely up the seasoning! Hope you get a chance to make it again soon! Made this for dinner last night & it was amazingly easy and so delicious! I was struggling and forgot a bunch of ingredients when I went to TJ’s but I used 1 bag of their already cut squash, Molly Gilbert’s enchilada sauce recipe (only takes 20 min) from Sheet Pan Suppers, and red beans because that’s what I had in my cupboard. This was the perfect dish to use the brick of locally made smoked colby I have! Hubby loved it & we are adding this to our dinner rotation! Sounds perfect! This one’s great for customizing, too. Glad you both enjoyed! My sister and I have decided to do meatless meals at least 3-4 nights a week. This dish was excellent – I used acorn squash and added corn. Served it over black rice. I also used baked corn tortilla chips because I was afraid the uncooked ones would get soggy. Delicious! I’m glad you guys enjoyed! I made this a couple of weeks ago and loved it! Making a bigger batch of it for a pot luck thanksgiving dinner. Do you think making it in a big skillet and placing it all in a foil dish to broil will have the same turnout? This was fantastic! I made it exactly as you said. Thanks!! Love your recipes! I’m late but I found this on pinterest. Just made it and was wonderful! Thank you! What if you don’t have an iron skillet to cook it in? You can use any oven safe skillet. Or skip putting it into the oven. Absolutely delicious! Perfectly balanced flavors & easy enough to make for a weeknight dinner. Yum! Can you freeze this for future use? We’ve been making this (or something based on it) for a few years now and we love it! We do leave out the jalapeno since we have a 5-year-old who doesn’t like anything spicy. We also tend to serve flour tortillas wedges on the side and just scoop up some of the filling to eat in them as the tortillas pieces got a little soggy for our preference when we included them in the skillet. The base recipe gives a perfect launching point for seasonings though! Great! This one is perfect for customizing 🙂 glad the whole family likes it.